Liquid foundation with an ultra-thin veil that fuses with skin. Skin with a radiant-moist finish that lasts all day. Containting 85% beauty essence. Skin care effect protects against dry and rough skin. 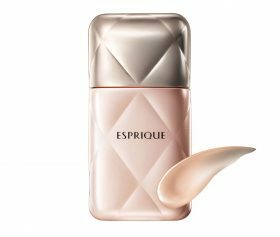 * Essence is the emulsion excluding the powder. “Moisture Tank” retains moisture while applied, creating plump texture. “Blend & Bond Complex” goes on thin and light, creating an ultra-thin veil that fuses with skin and naturally covers pores and uneven color. Resists streaking, easy for anyone to achieve an even skin tone. “Natural Radiance Ingredient” produces a gentle and natural radiance, as if skin has just been cared for and has good texture. “Super Flat Powder EX” covers unevenness by matching the size of pores. Blocks UV rays and prevents dark spots and freckles due to the sun. *Not a guarantee that skin irritatation will not occur for all individuals. Use after preparing skin with makeup base. Before use, shake well in an up and downwards direction with the cap on.